Let's diligently look for the "way of escape" in all temptations, not just lust, and not play the fool's game of seeing how close we can get to sin without actually sinning! thanks so much - very pretty! This is so pretty!!!! Thank you so much for your generosity! 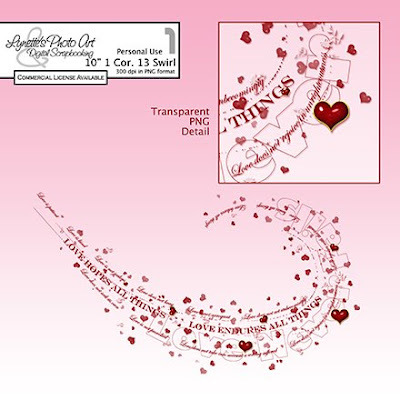 Lynette...This "Love" Swirl is just OUTSTANDING! Beautiful, Beautiful work! Thank you for sharing your creation. I can't wait to use it! It`s the most beautyful wordart for Valentine I`ve seen. Thank you very much sharing. i've been looking for christian artists and scrappers - i'm so glad i finally found you blog. you are truly gifted - thank you so much for your wonderful art and for sharing it!